As someone who is interested in the architecture of cities and how everything in them functions, right down to the streets, I'm fascinated by how successful cities like Phoenix and Los Angeles have been in protecting neighborhoods from traffic. If you've never realized that, I owe you a thank you, and I feel kinda sad that you've always been on the other side of the equation. Please let me explain. 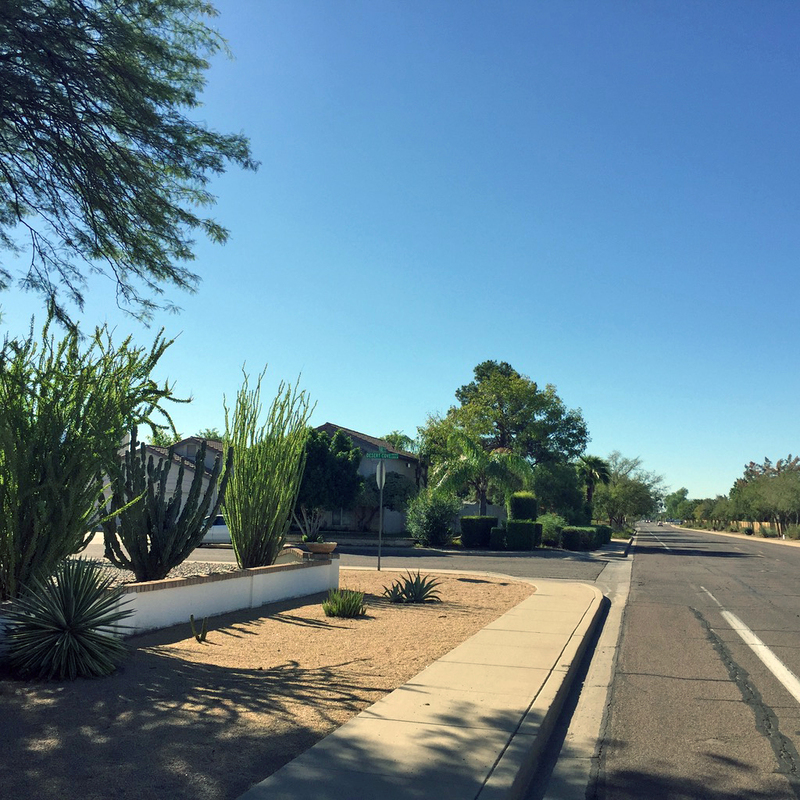 I was out walking this morning in Glendale (a suburb of Phoenix) since it was such a beautiful day. I took the photo at the top of this post as just a typical view. And it's what you're not seeing that I want to point out - traffic. 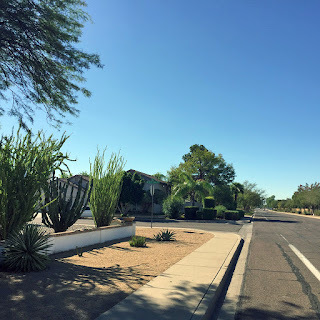 Now don't get me wrong, as I walked along the neighborhood streets there were a few cars this morning, but mostly they were doing the thing that cities like Phoenix and Los Angeles have been designed to do, they are getting out of the neighborhoods and onto main streets and freeways. If you could see way down there to the busy intersection, you'd see a LOT of cars. Yeah, it was rush hour when I was out walking this morning. Now don't get me wrong, I would imagine that most modern cities have done this. I only know Phoenix, Los Angeles, and where I grew up, Minneapolis. Even Minneapolis has plenty of freeways, and some very wide streets to move traffic back and forth. And of course most people only remember the quiet little streets from their childhood because as soon as they get a driver's license, most people spend their time on the freeways, and major streets. I've always avoided freeways and major streets. I've been lucky that I haven't needed to spend all that much time there. Yes, of course I've been there, and more than I ever wanted to. And yes, it makes sense to be there in a car, where you can get from point A to point B as efficiently as possible. That's why all of this works. It's just human nature to want to get where you're going as quickly as possible. I've known people in LA who will drive several blocks in the wrong direction in order to pick up a freeway, and even in Phoenix I've known people who will drive several blocks north out of my quiet little neighborhood in order to be on a major street, even if their destination is south. There are no signs that say "cars must get off of the neighborhood streets immediately", but it works out exactly that way. It's as if cars don't belong there, and they need to get out. In fact, it works so well that most of the people I know don't ever spend any time in their own neighborhoods. They get in their car and immediately go to a major street or a freeway. The effect is wonderfully quiet neighborhood streets. Now that the weather is nice I may go walking again tomorrow, on the quiet streets. Image at the top of this post: Looking south on 63rd Avenue at Desert Cove, Glendale Arizona, during rush hour.